BOSTON — Celtics All-Star point guard Kyrie Irving said Tuesday that a contract extension this summer doesn’t make sense for him and that while he’s already bracing for the daily questions about his future, his sole focus is on getting healthy for next season and helping Boston take another step toward title contention. Meeting with Boston reporters for the first time since March to cap a day spent promoting his “Uncle Drew” movie, Irving said it “sucked” to be sidelined for the postseason, glowed about Boston’s future potential, acknowledged the challenge of competing with the Golden State Warriors and said he would leave roster decisions to management when asked about the possibility — no matter how remote — of being reunited with potential free agent LeBron James. Irving is eligible for an extension this summer but, even coming off another knee surgery that sidelined him for Boston’s improbable run to the cusp of the Finals, was adamant that he’ll wait for the summer of 2019 to examine his future. “Contractually, financially, [an extension] just doesn’t make any sense,” Irving said. Irving is eligible for a four-year, $107 million extension, but that would be $80 million less than what he could earn if he waits until the summer of 2019 and re-signs with Boston after opting out of the final year of his current pact. “My hope is that maybe we could limit it to maybe one question a day about what I’m doing next year,” Irving said half-jokingly to reporters. “That’s my hope. But obviously I can’t really control that. 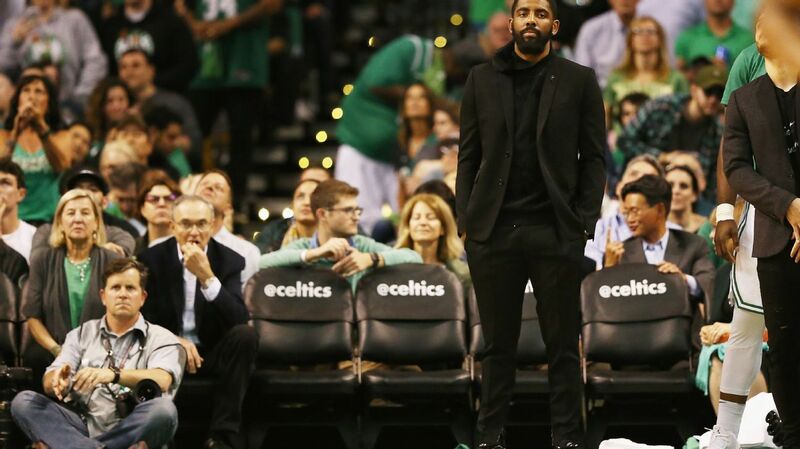 Wearing a gray suit and T-shirt, Irving gushed about what Boston’s young players accomplished in the postseason, especially playing without both Irving and Gordon Hayward. “I couldn’t be more proud of what [Boston’s young players] experienced — I mean they went to Game 7 of the frickin’ Eastern Conference finals,” Irving said with a playful shrug. The market officially opens July 1, but NBA free-agency news is coming in fast. Stay up-to-date with the latest rumors and rumblings. Irving didn’t try to deflect when asked about James and the possibility that the Celtics could be a wild-card suitor if he opts out of the final year of his deal. Irving did note that he hasn’t had any conversations with Boston’s front office about James and said he appreciates the transparency of team brass as they map out their future vision. • Irving said he’s navigating his rehab with caution but he’s clearly aware of his target date. “Me and my strength and conditioning coach, we’re taking it one day at a time. I think around this time is probably 15 weeks until the third week in September — not that I’m thinking about it or anything — so I’m excited to just really utilize this offseason to dedicate myself to my craft and things outside of it,” he said.